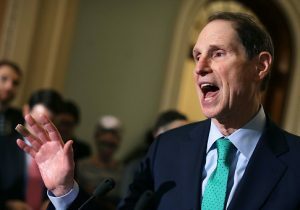 Oregon's two Democratic senators are blocking one of President Trump's judicial nominees with claims that a "longstanding" state tradition mandating that nominees be chosen from their "judicial selection committee" was violated, but the tradition they cite has never applied to picks for the U.S. Circuit Court, according to records viewed by the Washington Free Beacon. Sens. Ron Wyden and Jeff Merkley alerted the White House that they would be blocking the nomination of Oregon native Ryan Bounds for a seat on the U.S. Circuit Court of Appeals for the Ninth Circuit. Bounds is currently serving as assistant U.S. Attorney for the District of Oregon. "We cannot return a blue slip on any judicial nominee that has not been approved by our bipartisan judicial selection committee," the senators wrote in a letter to the White House referencing the informal "blue slip" process by which senators are able to block nominations of judges from their home state. "We have a long history of organizing a committee charged with thoroughly vetting applicants from the Oregon legal community," the senators wrote. "We do not intend to return our blue slips for Ryan Bounds or any other nominee that has not been selected through our judicial selection process." Though Wyden and Merkley refer to this selection process as a "longstanding" tradition, records show that nominees for the U.S. Circuit Court such as Bounds have never been selected in this fashion. Bounds is nominated to fill a seat on the U.S. Court of Appeals for the Ninth Circuit vacated by Oregon Judge Diarmuid O’Scannlain, who notified former President Obama that he was assuming senior status on the court last September. The last Oregon vacancy in the ninth circuit came during the Clinton administration when Oregon Judge Edward Leavy assumed senior status in 1997. Leavy's replacement, Judge Susan Graber, did not come out of a selection committee—in fact, she said that one didn't even exist. "There is no selection commission in my jurisdiction to recommend candidates for nomination to the United States Court of Appeals," Graber wrote in her official judicial nominee questionnaire. Graber went on to explain she was selected for the seat after she reached out to President Clinton. "I informed the President by letter of my interest in being considered for that vacancy," Graber wrote. "His response stated that he had referred the matter to the White House Counsel's Office." Wyden, already a senator, had no problem with the Graber nomination, despite the fact that it came from the White House. "Graber comes today with the strong bipartisan support of the Oregon congressional delegation," Wyden said during Graber's confirmation hearing, noting also that she was a "long-time personal friend." Wyden's Republican colleague in Oregon, former Sen. Gordon Smith, also voiced support for Graber. Smith's then-state director, Kerry Tymchuk, recalled in an interview with the Washington Free Beacon that there was no selection committee for Graber's nomination. "Graber was certainly a qualified appointment, but there was no panel, nor would I say there should have been," said Tymchuk, currently executive director of the Oregon Historical Society. Tymchuk explained that Smith and Wyden did work together on a selection panel during the 12 years they served together in the Senate, but that it only was responsible for sending the White House recommendations for District Court judges. "The Circuit Courts don't just serve Oregon, they serve the entire ninth circuit," he said. "The position doesn't even have to come from Oregon, they could appoint somebody from anywhere in the ninth circuit." Tymchuk said there has "never been" a selection committee for Circuit Court appointments. Neither Wyden's nor Merkley's office responded to requests for comment. Kristian Roggendorf, an Oregon lawyer with 17 years of experience who knows Bounds personally, concurred with Tymchuk that the judicial selection committee has only ever applied to district court appointments. He said this is a "political game at this point" played by Democrats. "Bounds is a pretty nonpartisan guy," he said. "He's not out there working for candidates or active in the Republican Party, he's just a good lawyer." The White House complained prior to its official nomination that it hadn't received "active engagement" from either Wyden or Merkley on its consideration of Bounds, which was communicated to the senators in May. White House counsel Donald McGahn says Wyden has declined to speak with him directly regarding the nomination. Despite the lack of factual backing for the senators' claims, the New York Times editorial board defended them. "Mr. Wyden and Mr. Merkley said Mr. Trump had completely bypassed Oregon's well-established bipartisan selection committee," wrote the Times. "These are fair complaints." In 2014, the Times editorial board called for an end to blue slips when they were being used by Republicans to block Obama nominations. Senate Majority Leader Mitch McConnell recently stated his belief that senators should not use blue slips to "blackball" circuit court appointments and be reserved only for blocking lower-level district court judges. McGahn wrote in a letter to the senators that he is confident that if they give Bounds proper "review and consideration," they will "agree that he is an outstanding choice." Fifteen of Oregon's 30 state senators, twelve Republicans and three Democrats, wrote to Wyden and Merkley on Tuesday to say they are confident that if they "were to meet with him and review his range of experience," they would "concur that Bounds should be considered by the Senate and would be easily confirmed."